Several MedAID partners have participated as invited experts in the meeting of the Scientific, Technical and Economic Committee for Fisheries (STECF) for the Economic Report of the EU Aquaculture sector (de EWG 18-19), JRC Ispra, 22 to 26 October 2018. Rasmus Nielsen from the University of Copenhagen, and partner of MedAID, has chaired the meeting, which was also attended by the following MedAID partners:Jose Manuel Fernández-Polanco and Ignacio Llorente from the University of Cantabria, Maria Cozzolino from NISEA, Lamprakis Avdelas from Greece. The objective of this Expert Working Group meeting is to prepare the 2018 report on the economic performance of the EU aquaculture sector, to analyse and comment on the economic performance of the EU and national aquaculture sectors between 2008 and 2016. It will include specific sections on employment (e.g.female/male employment and average salaries), economic performance contrasting different segments, and productivity/employee at EU level as well as a brief summary for each national chapter. The two main objectives for the 2018 exercise are to increase qualitative interpretation of all data outputs and to increase the usefulness of the report for DG MARE’s policy development as well as for Member States and the industry. This aquaculture report is one of the main source for providing socio-economic analysis on the performance of the EU aquaculture industry. 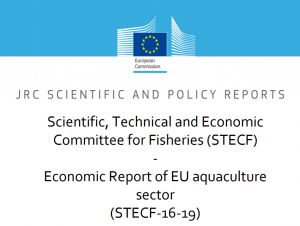 Different reports about Economic Analysis of European fleet, processing, and aquaculture sectors can be found here, included the previous report EU of the Aquaculture sector published in 2016, which reported for the period between 2008 and 2014. The General Fisheries Commission for the Mediterranean (GFCM), a regional fisheries management organization (RFMO) established within the FAO with main objective to ensure the conservation and the sustainable use, at the biological, social, economic and environmental level, of living marine resources and the sustainable development of aquaculture in the Mediterranean and in the Black Sea, organized a workshop on animal health and risk analysis in finfish aquaculture. The workshop was held in Larnaca, Cyprus, on 3-4 October 2018 and gathered experts from more than 20 countries. The main objectives were, among others, to assess the current situation regarding early diagnostics in fish farms, regulation, capacity in diagnostics, control and prevention of diseases, epidemiological knowledge, governance and challenges for aquatic animal health.